Mentor groups are great, going from a little sister to a big sister is very exciting! All students who compete with The Dance Academy of Bartlett (Seniors, Juniors, Juniorettes and younger competitors) are assigned a big or little sister/brother. These kids support each other (especially those younger than them, those new to competition and those new to the studio). They give each other token gifts at Christmas; sometimes at the first competition they go to, etc. They can ask questions they may not feel comfortable asking the teachers. They come and watch each other at competitions even if they aren’t required to be there yet. 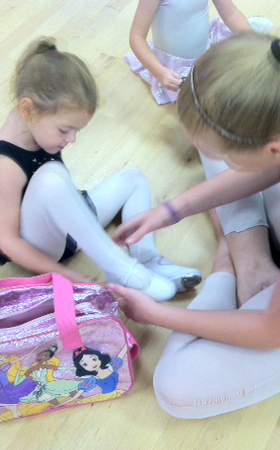 They help each other with costume changes or doing hair and makeup (especially if for the first time). This makes all students feel a part of the group. It helps nerves backstage. It gets everyone involved a bit more and makes the whole competition process more fun. It also helps students get to know dancers that are not in their class and feel like the whole studio is a united and supportive group. We always have a “Welcome Back to Dance” party in the fall for all competitors and play a game to find your big or little sister/brother.